These best-in-class products are manufactured in the U.S. and China and supplied through our distribution centers in Minnesota, Belgium, Japan, Korea, China and Australia. What sets Graco apart from the competitors is their history, a focus on highly-engineered, quality products, industry-leading innovation and the solid partnerships we form with customers and suppliers around the world. Graco has several types of Piston pumps, electric, pneumatic, and hydraulic operated, including their non-sanitary and sanitary versions. Sanitary piston pumps are ideal for most food-related, cosmetic and personal care applications. 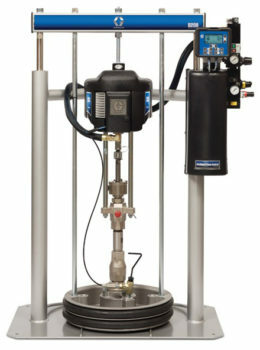 Graco industrial or ink Piston pumps are ideal for inks, lubricants, paint and more. Graco has several Piston pump arrangements, whether it needs to be used indoors or outdoors, hung on a wall or put into the drum, there is the correct configuration to fit any application. Find the right pump for your specific needs. Husky Series is offered from 1/4″ up to 3″ models with flows from .24 GPM up to 300 GPM and pressures up to 125 PSI. 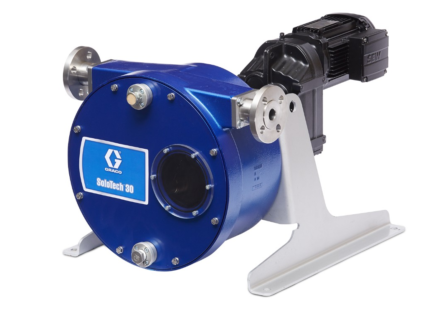 This is Graco’s standard offering for AODD pumps in industrial applications, such as sump or transfer applications. Models include 205, 307, 515/716, 1050, 1590, 15120, 2150, 2200 and 3300. Saniforce Series is offered from 1″ Tri-Clamp fittings up to 2.5″ Tri-Clamp fittings with flows up to 150 GPM and pressures up to 120 PSI. With FDA and 3A certifications, these pumps are ideal for the Food and Beverage industry. Models include 515, 1040, 1590, 2150 and 3150. ChemSafe Series is offered from 1/4″ up to 1 1/2″ configurations with flows up to 99.5 GPM and pressures up to 100 PSI, these leak free, CNC machined molded pumps offer corrosion-resistant exterior with no exposed metal. Ideal applications include chemical transfer or abrasive applications. Models include 205, 307, 5151, 1040, and 1590. 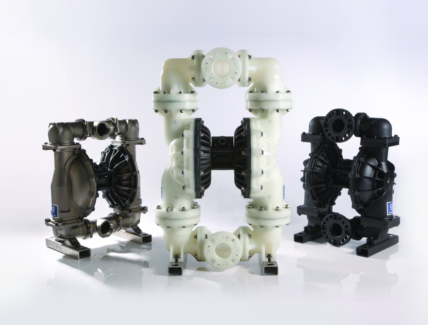 The Electric Double Diaphragm pumps are ideal for applications that require low pulsation and a smooth flow in both Industrial and Sanitary applications. The patented air charged drive allows for the elimination or reduction of pulsation without expensive pulsation dampeners or surge tanks. Patent pending technology allows pump to stall under pressure preventing pump failures from clogged lines or closed valves. Energy efficient electric drive reduces energy consumption up to five times compared to traditional air operated diaphragm pumps while being able to meter applications when needed with the control of the motor. Pump materials include Aluminum, Stainless Steel and Polypropylene with an elastomers to meet any application. Graco Peristaltic Hose Pumps are ideal for Industrial metering and transfer. Graco’s SoloTech hose pump design utilizes a single roller that compresses the engineered hose through a full 360 degrees of rotation. This innovative design means longer hose life when pumping caustic, abrasive or sensitive materials for metering or transfer. These pumps are inexpensive to maintain because there are no valves, seals or glands. The pumps are reversible and can be used to empty lines or clear blockage. With pump sizes up to 1″, numerous material options and suction lifts up to 29 feet, there is a pump to meet many applications. Graco offers many configurations of Pail, Drum and Tote evacuation systems for the industrial and sanitary markets. 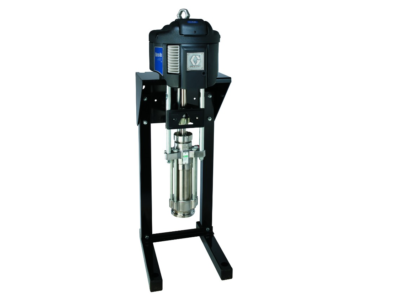 From all FDA sanitary packages to unloading grease or paint, there is a configuration using the many Piston pump or Air Operated Double Diaphragm pump offerings from Graco that will meet your application. Saniforce Drum Unloader Systems– ideal for evacuating from 55-gallon drums with evacuation rates of 99%. These utilize sanitary flange clamps for quick disassembly and liner guards to prevent bags form entering pumps. The ability to piston pumps or air operated diaphragm pumps allow ultimate flexibility. Saniforce Bin Evacuation Systems– ideal for evacuating from 300-gallon containers without dilution of product and the ability to use up to four pumps to increase flow rates. These are designed with inflatable wiper seals and a unique floating ram plate to increase efficiency and make faster change-out of bins. Industrial Supply Systems- ideal for evacuating from 16-gallon pails or 55-gallon drums with reliable delivery of one-component sealants, adhesives and other medium to high-viscosity materials to metering and dispensing systems. Graco offers multiple different products for sealant and adhesive systems. 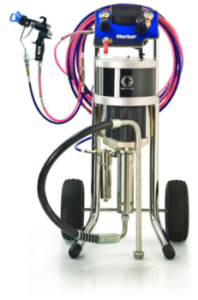 Graco offers applicators, supply systems, valves, and metering, mixing, dispensing equipment as a part of their extensive offering in sealant and adhesives equipment. Examples of their supply systems include evacuating from 16-gallon pails or 55-gallon drums with reliable delivery of one-component sealants, adhesives and other medium to high-viscosity materials to metering and dispensing systems. They offer two part mixing and dispensing systems such as the ExactaBlend AGP, which takes two different materials out of drums or pails and mixes them to the correct to ratio, which then can be fed through a gun and onto your piece of work. Graco has a sealant and adhesive package to fit any of your needs. Graco offers a complete line of Finishing equipment for any industry. Products include Spray guns, accessories, plural component mix systems, pumps and complete spray packages. 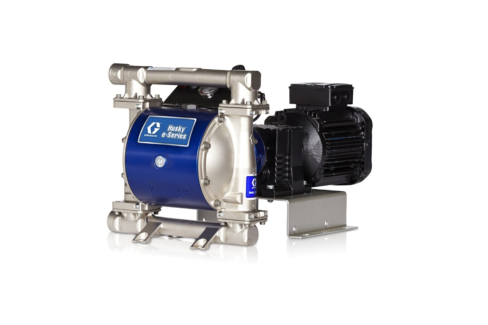 Examples of Graco finishing pumps include the Dura-Flo, Xtreme, President and Monark series that offer flows and pressures for numerous applications. Examples of complete spray packages include the Merker air-assist and airless package or the Triton pump packages. With a vast range of offerings, Graco has a finishing package to complete any job. Graco’s pressure washer and cleaning packages include the Hydra-Clean Air-Operated Pressure Washers and the Hydra-Clean Hydraulic Pressure Washers. The durable Hydra-Clean pressure washers are available as cart-mount or wall-mount units and can clean the toughest environments like oil rigs, shipyards, mining, agriculture and construction equipment or food and beverage facilities. Hydra-Clean pressure washers also carries a safety benefit because there’s no risk of sparking, unlike gas or electric pressure washers. 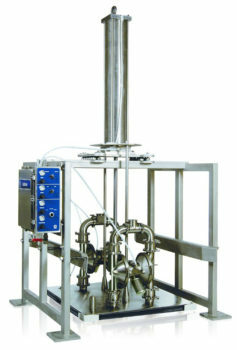 The fluid section contains stainless steel wetted parts and can handle the most aggressive cleaning materials. Graco’s Hydra-Clean pressure washers are a quick, easy and efficient method to clean up in your toughest environments.